Eczema dry skin is extremely itchy, excessive scratching only aggravates the condition. Eczema is a general term used for describing various types of skin inflammation - dermatitis. Although its cause is not completely known, it is supposed to be an abnormal response of the body�s immune system to the influence of the external factors, sometimes aggravated by stress and anxiety. The condition is often irritated by sweating, exposure to extremes of temperature (heat, cold), and abnormal condition of the skin (excessively oily or dry skin). Eczema can occur at any age but is most common in infants to young adults, it can affect any part of the body; however, in infants, it is often localized to the forehead, cheeks, forearms, legs, scalp, and neck. In children and adults, eczema typically covers the face, skin and linings of the nose, neck, and the insides of the elbows, knees, and ankles. In later years may appear varicose eczema that is caused by blood circulatory problems in the legs. 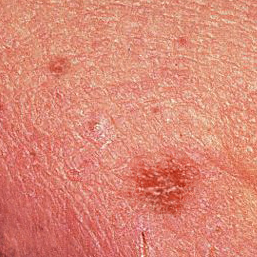 It is characterized by reddened, flaky skin, sometimes cracked or covered with tiny blisters; it can be either widespread, or limited to a few areas. In this condition the skin is extremely itchy, but scratching and rubbing are further damaging the skin and exacerbating the problem. In some cases excessive scratching causes the skin to thicken and its texture becomes leathery. Eczema is not contagious and for the moment cannot be utterly cured. Nevertheless, the symptoms of the condition may be managed well with treatment and avoidance of causative agents (triggers). discoid eczema appears and disappears suddenly by its own, is characterized by small distinctive coin-shaped itchy red spots of severe dermatitis that may affect any part of the body, but typically develop on the legs and buttocks. It seems to appear more frequently in cold seasons when the skin is getting dry. to prevent and care for eczema use shielding lotions when working with marginal chemicals (household, art, crafts, agriculture). "Hi - this is the first time in my life I've ever contacted a company to give either positive or negative feedback, but your product has changed my life so much I couldn't not tell you. I've suffered from severe pompholyx eczema on my hands since I was 15 years old. I'm 32 now and have tried everything you can imagine and spent so much money on possible cures. It's affected every aspect of my life - work, relationships, my confidence - just handing money over in shops made me feel horrible. And I've always wanted to be a midwife but I knew I couldn't do it with my hands the way they were. I stumbled across your product one day looking around on the Internet and tried it. I cannot tell you how glad I am. I haven't had one blister, one bit of dry skin, nothing. It's been months now and I religiously use it every few hours and it actually works. I've used so many steroid creams since I was 16 that have thinned my skin and not done an awful lot else. I think more doctors need to know this exists. I really also think you need to market it more in the uk. I was lucky to come across it - I've told a lot of friends about it and will carry on recommending. Sorry! I never meant this to turn into such a long email - I just wanted to say thank you so much. Please don't ever stop making it. "I am a knitter who suffers with eczema on my hands. They are also extremely chapped due to the cold and dry weather in New England. I have medications, as well as a variety of hand lotions, which are satisfactory, but I never feel that my hands are very smooth. When shopping for yarn in a local knitting store, I complained that I cannot purchase the new suede product because my eczema hands are too rough. The owner of the shop had me try Gloves in a Bottle. After only a few applications, I noticed a huge difference in my hands and am now knitting myself a suede shawl. Can you please send me a list of pharmacies, which carry this hand lotion? I have ordered a supply from your online services; however, I would like the convenience of purchasing it locally, if possible. "I wanted to say THANK YOU for your product. I have been having severe eczema on my hands and patches on my legs for more than five years. My dermatologist prescribed me eczema drugs worth $400. When I ran out, I saw your lotion and got a small bottle. It cured my eczema in less than 2 weeks!!!!!!! And I had a severe eczema, I mean � SEVERE!! I had to have leave of absence from school for all this time, it was so bad. Now I am back to school (I study different skin care programs) and I have been a spokes person for a month now � telling everyone how great it is and showing the bottles I bought. My friend has kids who have dermatitis and she said it was clearing up in days!" "I have lived with eczema for 20 years and have had to be very particular about hand cream and lotions. Your product is wonderful! I am able to do daily chores like cooking, cutting vegetables, cleaning etc, without wearing gloves." "My dermatologist recommended Gloves in a Bottle to protect my hands...I have some sort of bad eczema on my hands that gets irritated with water, cleaning supplies, soaps, etc. I have a 2 yr old son and a 3 mo old son, so you can imagine how difficult it is to keep water soaps and cleaning supplies away from my hands. I purchased the product and have been happy with it, and even gave a bottle to a coworker to try. She laughed when I told her the name of the product, but she was a believer after she used it." "I love this product! It was recommended to me by my dermatologist for my eczema on my hands and elbows. Although the eczema isn't cured, Gloves in a Bottle surely helps keep it in check. It especially helps during the winter here in Michigan when the weather is extremely dry and harsh. I keep a bottle in my purse, my car, at home, and at work." "I have pompholyx eczema, and through years of lotion & potion testing have found one that actually works. I've tried just about anything the doc can give me, way to many drugstore creams and a few old wives tales, but recently I was in a secret exchange and my partner sent me a sample size of a lotion called Gloves In A Bottle. Boy was that stuff brilliant!! For the first time I spun laceweight without my control finger becoming raw & blistered! I ended up shipping quite a few bottles of it over here to the UK and it continues to knock the eczema on the head every time it thinks about breaking out. I don't get to bad a breakout, only the one finger really but it just happens that its my control finger during spinning so its a big pain when it happens as it used to mean spinning a bobbin of laceweight could take me up to 2 weeks to do rather than 2 or 3 sittings." * Gloves In A Bottle, Inc. makes no claims that its product could be used in the diagnosis, cure, mitigation, treatment, or prevention of eczema, psoriasis, skin allergies, dermatitis, or any other disease; or is intended to affect the structure or any function of the body. Gloves In A Bottle is not intended to protect against any chemicals or irritants other than dirt and grime. Always follow manufacturer's safety directions when handling any harmful substance. Gloves In A Bottle is not a substitute for required safety protection, including gloves.